Excel Dryer, Inc. took part in the 75th Annual National School Boards Association (NSBA) Conference held at the Music City Center in Nashville, Tennessee on March 21-23. This national event brought together more than 7,000 leaders in education to discuss the ever-changing landscape of their field. Excel Dryer, Inc. had a booth at the event and presented a Technology + Learning Solutions session. At the Excel Dryer booth, visitors experienced the power of the XLERATOR and XLERATOReco® through hand dryer demonstrations. Guests created a customized cost-savings analysis and learned how much money their institution could save by installing high-speed, energy-efficient XLERATOR automatic hand dryers. On March 22, Michael Savitt, field sales manager at Excel Dryer, Inc., presented “Fostering Health and Wellness: A Study on How School Officials Can Realize Cost Savings by Adopting Energy-Efficient Restroom Technology.” He discussed high-efficiency fixtures, the cost-savings calculator available at exceldryer.com, and Excel Dryer’s partnership with the U.S. Green Building Council Center for Green Schools. As a field sales manager, Michael helps save schools money. During his presentation, he explained how washrooms are a drain on a school’s budget simply due to waste like paper towels, trash can liners, and cleaning supplies (not to mention the janitorial and waste removal costs). Michael outlined how installing high-speed XLERATOR hand dryers save schools an average of 95% versus paper towels while using 80% less energy. The typical return on investment for schools that retrofit their washrooms with XLERATOR hand dryers is less than one year, including installation costs. 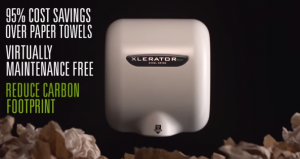 If those savings weren’t enough, Michael explained that installing high-efficiency fixtures like XLERATOR hand dryers can help schools qualify for LEED® v4 credits. LEED, or Leadership in Energy and Environmental Design, is a program that recognizes best-in-class building strategies and practices. LEED Certified schools have opportunities for incentives like tax rebates and zoning allowances. Michael held a captive audience when he spoke about the cost-savings calculator available at exceldryer.com. By simply filling in 4 key figures into the calculator; # of Cases Purchased Annually, Cost Per Case, # of Paper Towels per Case and Current Rate of Electricity per kWh, an administrator can view a detailed analysis of both the cost and environmental savings to their school achieved by installing high-efficiency XLERATOR hand dryers. He gave an example of a school that used 250 cases of paper towels annually and how by installing XLERATOR hand dryers, the school saved almost $16,000, generating a nearly 97% annual savings. about the products Excel Dryer has introduced to help K-12 schools save money, go green, conserve energy, and improve the cleanliness of their washrooms.” To that end, Michael told them about the energy-efficient Green Apple XLERATOR hand dryers that are available for any facility to buy, with a percentage of all proceeds going back to support the Green Apple program. Excel Dryer is an original seed sponsor of the Green Apple program, an initiative from the Center for Green Schools at the U.S. Green Building Council (USGBC) to create healthy learning environments for children.